5555 N. Lamar is a big place, and we chose our location, suite C105, for good test riding, not visibility. Putting our address, 5555 N. Lamar, into your GPS will get you close to us, but not all the way. Putting in our GPS coordinates 30.3236N 97.72555W will get you right to our door. 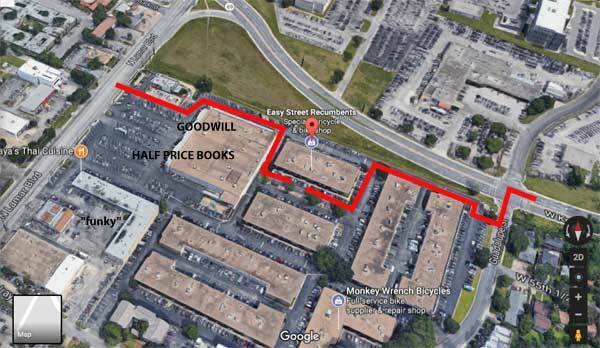 If you come in from the Lamar side, to the west, you will see Half Price Books and Goodwill. Our shop is in a courtyard directly behind the HPB/GW building. If you come in from the east side, off of Guadalupe St., there are several entrances off of Guadalupe. Building E faces Guadalupe and Building D is just behind that. Building C (where we are) is just past building D, and is closest to Koenig Lane, to the north. You cannot access our parking lot directly from Koenig, only from Lamar (to the west) or Guadalupe (to the east). When in doubt, call us at 512-453-0438. We are used to helping people find the shop. If you are lost in the business park we’ll ask you what businesses you see. If our van is parked near the shop you will have an easy time spotting that. Sometimes the van is parked out by Lamar. Note also that our neighbor at 5501 is also a business park, just more…. well… “funky.” They also have a C105, but it is full of people lifting weights, without a tricycle in sight. There is a very good Thai restaurant there, but if you aren’t hungry keep north of that and aim for the Half Price Books, fronting 5555. Drive behind the HPB and look around.